This nighttime regenerating eye treatment strengthens and rebuilds skin to leave the eye area firmer, brighter and younger-looking. Reduces fine lines and wrinkles with the proprietary Glycolymer Complex. Hydrates and restores depleted skin. 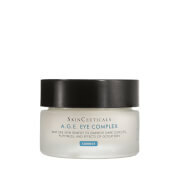 Glycolic Acid helps to firm and tighten the eye area. Use once or twice a week, at night: Apply to eye area. Avoid eyelids. Agua (Distilled Water), Milk Caprilic/Capric Triglycerides, Octadecanoic Fatty Acid (Plant Oils), Cetearyl Polyglucose, Glycolic Acid, Glycerin*, Plant Collagen, Pentapeptides, DNA/RNA (Plant Oils), Borage (Borago Officinalis) Seed Oil, Ricinus Communis (Castor) Seed Oil, Mucopolysaccarides, Aloe Barbadensis Leaf, Olea Europaea (Olive) Oil, Prunus Amygdalus Dulcis (Sweet Almond) Oil, Liposomes, D-alpha- tocopherol (Vitamin E), Retinol, Beta-glucosamine, Beta-fructan, Aminoguanidine, Banana Oil, Benzyl Alcohol. 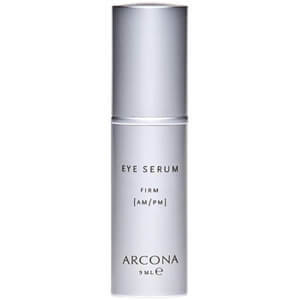 I like the Arcona brand a lot. However, this cream gave me a horrible rash and puffiness under my eyes. I had to take benedryl and it took several days for it to disappear. I received this as a free gift with a recent purchase and have been using it about twice a week for the last month. I'm in my late twenties and have been quite diligent about skin care since my teens. 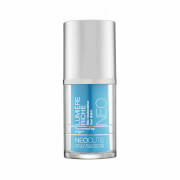 A few fine laugh lines are trying to appear in the corners of my eyes and this product has definitely smoothed them out. I even use this on my lips right before bed and my lips are always smoother the next morning. As for the mentioned smell, I'm used to natural products and prefer them so the slightly cinnamon smell does not bother me at all as it quickly disappears. 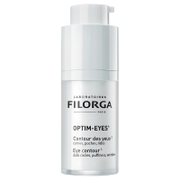 I have seen more results, more quickly, with this eye cream than with any other. This cream manages to be emolliant, while effectively resurfacing the skin under my eyes. I had something akin to "chicken bumps", and using this product twice a week eliminated them and the fine lines I had. I am mystified by the other poor reviews. I think this product is amazing! So this product seemed fine at first, I didn't think it was harsh. Then I noticed slowly that my eyes were starting to look rough. So I of course panicked (I'm in my late 20's) and started being super vigilant about using eye products in the am/pm. Then I started to notice that the days I was using my am one in the pm instead of this that my eyes were looking better. Skipped using anything in the pm, my eyes still looked dramatically better than when I used this. It was irritating my skin and I didn't even realize it and I can normally use ANYTHING on my face.